Who amongst us doesn't walk in the door and "dump" stuff? Be it your keys, your coat, your cell phone or the grocery bags — most people walk into their house and set something down. So a great tip for managing this activity and not ending up with a chaos-filled entrance to your home is to create what I like to call "The Drop Zone". This kind of space is really helpful in areas like mud rooms, entryways and master closets. If you plan ahead in your closet design, you can incorporate things like hooks for keys and outlets to plug in electronics that need to be charged. 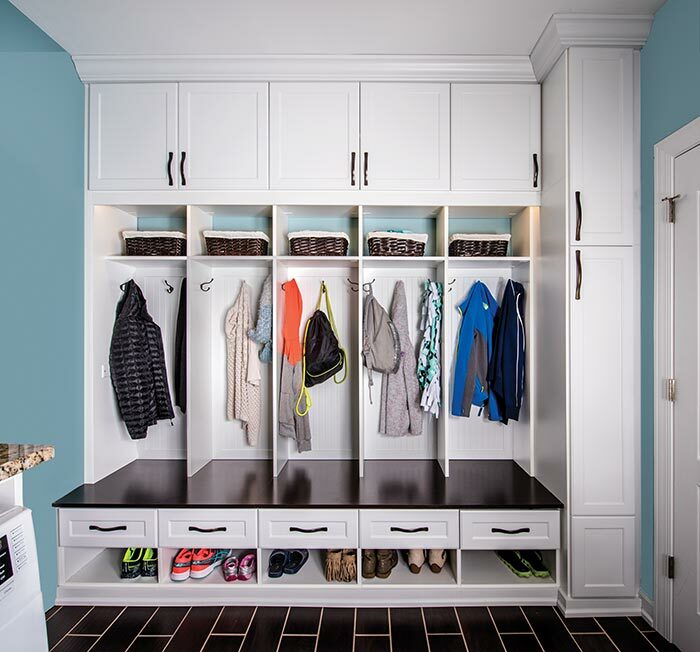 If you are tired of picking up children's coats off the floor, try replacig the traditional closet with a hall tree that includes a storage bench. Most children find putting a coat on a hook to be much easier than hanging something up in a closet. The lower heights of the hooks, in combination with the built-in seating make this a kid friendly solution they might just use. She storage is provided underneath or in the narrow closet to the left. In many households, the closet is the new hub of the home. Consider adding a closet hutch or small island against a wall with an outlet if you don't already have one, as a convenient place to charge electronics and stage a suitcase. Everything will be organized and ready for you when you leave in the morning, making it easier to get out the door on time. Ladies — if you change out your handbags frequently and store your purses in your closet — consider a drawer that allows you to "dump" current contents and easily put them back in to your next purse of choice. A basket on a dresser or a top drawer that's deep enough works great to serve this purpose. And group some items together in smaller bags that fit inside your purse (combine things like personal grooming items in a zipper pouch and receipts in an envelope) to make it even easier. And should you need help with ideas to make your life easier, set up a design consultation with one of our expert design consultants, because at Closet Works, we're extremely passionate about being extremely organized — and we love sharing our passion with people who want to make their lives easier to live. Consider keeping your shoe storage (at least for the ones you wear all the time) next to the door where you usually enter the house rather than the bedroom closet. This is especially helpful if you usually take off your shoes when you enter the house. 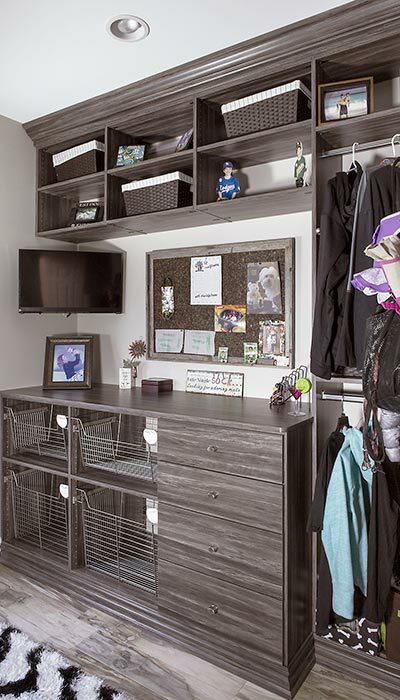 Drawers and baskets along with a desktop and bulletin board make perfect catchalls for everything you might want to leave at the back door. A traditional reach in closet can be repurposed for this without loosing hanging space by incorporating double hang rods into the design. 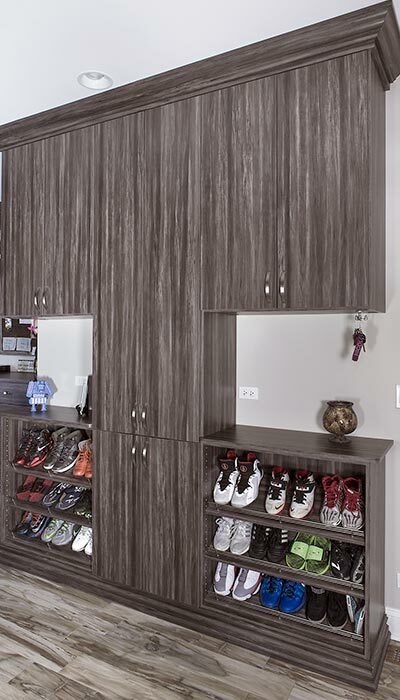 A hall tree with storage bench is a great solution to mud room or rear entryway organization. Between the shelves and cabinets above, hooks for jackets, purses and backpacks, intergrated seating and shoe storage, there is room for everything you need to "dump". 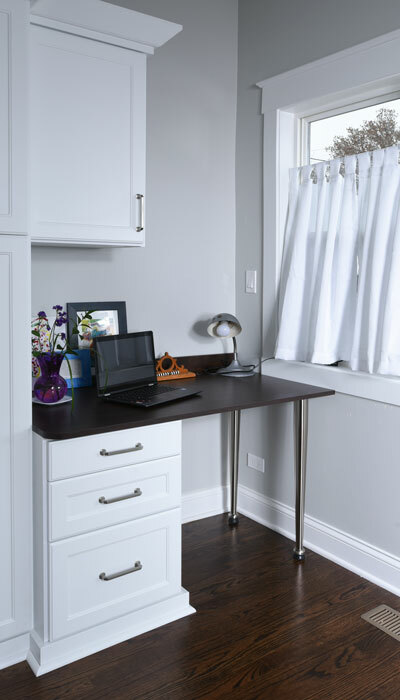 A desk next to the back door works for many people as a convenient place to keep the laptop, keys and cell phone. Receipts can be filed immediately when you walk in the door. Everything will be ready to go when you leave and you will be less likely to forget anything if it is right next to your coat. Countertops integrated into the closet design can provide good places to charge cell phones, laptops and tablets. A popular option in current closet design is to include a staging area for packing or unloading a suitcase (below mirror in this design), making business travel a little bit easier.